Paris was the first truly modern large city. But it has remained largely unchanged since the 1860s. Now, French President Nicolas Sarkozy has a vision to turn Paris into a model super-metropolis for the 21st century - a post-Kyoto sustainable city of 12 million that will break down the distinction between downtown and suburb, and that will drive France's economic growth. He calls it "Grand Paris" and he is determined that it will be the crown jewel of his legacy. To realize his vision, Sarkozy's government engages 10 star architects, including France's Djamel Klouche and Roland Castro, Mike Davies from the UK, and Winy Maas, from Holland. Their mission: to spend a year rethinking Paris. GRAND PARIS offers a compelling and sometimes suspenseful chronicle of the process, as the architects try to distill months of research and discussion into workable plans. It takes us inside some of the world's top architectural firms, as they compete for an opportunity to reshape one of the world's greatest cities. The film focuses particularly on Winy Maas, whose designs include the Netherlands' pavilion at the 2000 World's Fair, and master plans for an eco-city in Spain and for the Dutch town of Almere. The challenges he and the other architects face are immense. How can industrial production and the knowledge economy be integrated? Should the city have one center, or be multi-polar? What kinds of transportation hubs are needed? How can residents of city and suburbs - separated physically, economically and by social status - be brought together in solidarity? Maas begins with aerial and walking tours of the city, and with interviews with people living in the region. The result is a catalog of the seemingly intractable problems that have plagued Paris for well over a century. They include the stark separation between the posh neighborhoods of the city proper and the sprawling suburbs that ring the downtown, a lack of effective public transit, an extreme housing shortage, and neighborhoods that combine old village centres with bland towers of low-cost housing units. According to fellow architect Patrick Celeste, the city is "a mosaic of obstacles." 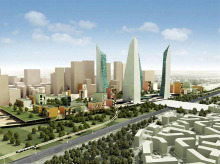 In addition to the demands of the Grand Paris project, Maas and the other architects in the film waver between being impressed with Sarkozy's vision, and worrying that they are simply being used for political purposes. For French architects the question is a particularly burning one. Are they being courted to truly bring about effective change in the city? Or to burnish the reputation of a leader whose politics many dislike? Despite the challenges, the Grand Paris architects are imbued with a sense of optimism and possibility. But when the world's economy comes near collapse, the planners must face the possibility that growth can no longer be taken for granted, and that the public may have lost the taste for large-scale projects. 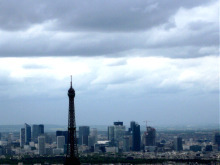 Will Paris be a bold model for future urban development? Or will the problems of the last 150 years drag on for decades to come? 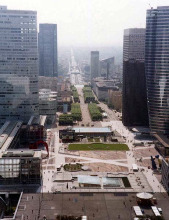 GRAND PARIS can be viewed in conjunction with Paris, Ring Road, an exploration of the changes wrought by the Boulevard Peripherique circling the city; and Paris, 19th century, on the dramatic overhaul of the city led by Baron Haussmann in the 1860s. Together, a triology of films on the dynamic evolution of an iconic global city.